The Critical Care Nurse Specialist is a relatively new certification that enables Clinical Nurse Specialists to care for acutely or critically ill patients. This certification shows that the Clinical Nurse Specialist has received additional training and is certified in this field of care for both adult and pediatric patients. Prepare with our CCNS Study Guide and Practice Questions. Print or eBook. Guaranteed to raise your score. Get started today! In order to be eligible to sit for this certification exam, the Clinical Nurse Specialist must be a licensed Registered Nurse and have graduated from an accredited school that offers a Clinical Nurse Specialist curriculum with a focus on critical care patients. The CCNS Exam fee is $325 for AACN members or $450 for non-members. The CCNS certification exam is offered at multiple testing centers throughout the United States. It is available year-round. 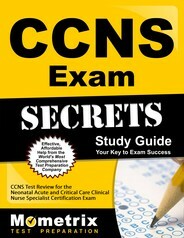 The CCNS exam consists of 175 questions and the applicant is allowed 3-1/2 hours to take the CCNS exam. The CCNS exam is broken down so that 78% of the questions pertain to patients of all ages, while 22% of the questions are specific to either adult or pediatric patients. CCNS Flashcards. 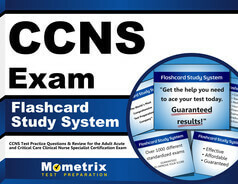 Proven CCNS test flashcards raise your score on the CCNS test. Guaranteed. In order to renew the CCNS credential, the Clinical Nurse Specialist must have completed at least 2,000 hours over the previous 4 years in providing direct patient care to the acutely or critically ill patient. At least 60 continuing education hours should have been completed, with at least 15 obtained from activities involving education in this area of specialization. If these requirements are not met, the CNS must retake the CCNS certification exam.